Creative Coach Collision Repair and Design Center in Lakeland, FL is a team of collision repair professionals. 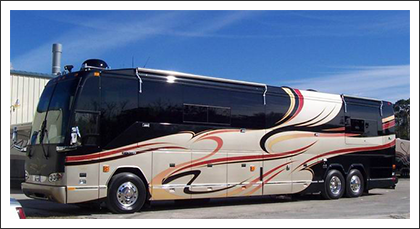 Creative Coach Collision Repair and Design Center is located in Central Florida, serving the motorhome community nationwide from its 16,000 square foot state-of-the-art facility in Lakeland. We are family owned and operated with three generations of motorhome enthusiasts and four generations of paint and collision repair professionals. Using the latest tools, technology and quality materials, it's our desire to provide our customers with a top-notch final product. Please take the time to read letters from some of our wonderful customers. Their appreciation, loyalty and friendship have made serving the motorhome community since 1997 such a pleasure. We strive to maintain the highest level of quality in not only our workmanship, but in the relationships we keep with our customers. Thank you so much for the beautiful work everyone did on our Monaco Diplomat. We brought you a mess with water damage in our floor. All of you dealt with us compassionately and thoroughly as you repaired the damage and replaced the floor. The people who worked on the floor are truly artists. The replacement could not have been easy. The walls all had to be removed and replaced after the floor was installed. You found and repaired another leak in the pipes that may have never been found. The tile and carpet are now a work of beauty. I know you have done this before but to do this work so well has met and far exceeded our expectations. It is truly a work of art. You are all exceptional artist. Your work is unique to the RV industry. I would like to recommend your work to anyone that has an RV! But I Need more work, just save me a place in line. Thank you again. We just wanted to express our gratitude to you and your staff for the excellent service you provided. Everyone is so professional and honest. It's a pleasure to do business with them. The work that was done to our RV was exceptional. Steve and I were overwhelmed by the care they exhibited as in completing the manufactures defects and replacing the mechanical equipment ie; the rear slide. They even repaired the trivial items that we just mentioned in passing. It’s rare in Florida to find a company whose employees are conscientious and pride in what they do. You should be very proud of your employees as they are a benefit to your industry. The handling of our insurance claim with Lester and the Adjuster, Rich Lachapelle was exceedingly impressive and the leadership of Glen and his explanation to us in terms we could understand was uplifting. We can’t express enough as to how happy we are. We will certainly pass on our experience with the RV community. Thank you again. I wanted to thank you again for the work you and Creative Coach did in repairing our Coach. Its looks better than the day we purchased it. Its always a pleasure to do business with people who are professional in their field. If in my travels, I find someone that could use your services, I will be sure to give Creative Coach the highest recommendation. Again thanks for the excellent job. Time after time, you all pull together when you work on our coach. We appreciate all you do to keep us on the road. Kudos to all of you & thanks. We just can’t thank you all enough for the quality of the workmanship to our Country Coach Intrigue. Please do not hesitate to have anyone call us so that we may share our experience with them.